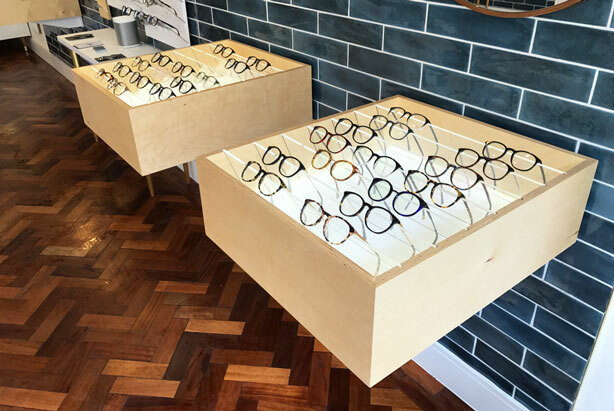 Exceptional yet affordable eye-wear brand Ollie Quinn has opened on Bristol's Park Street with an open spacious feel. We are used to seeing subway tiles in cafe's and restaurants but how about in a retail environment? The glossy texture and calm colour palette provide a visually interesting but not dominating look and feel to the space. On-brand mirrors make trying on the unique styles easy to see. 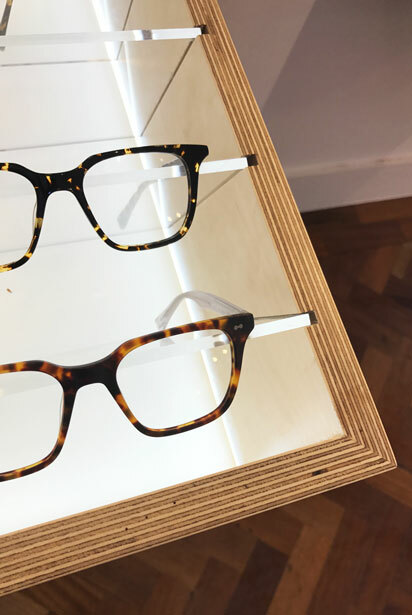 Glasses are simply displayed on angled layers of acrylic - entirely removing the issue of trying on then attempting to put glasses back on an awkward shelf or hook. The embarrassing situation of knocking a while row of glasses off a vertical display has been nicely dealt with making the trying on experience much simpler. While the front of the store grabs attention via the full height tiled wall and bold gold effect logo, the rear of the space resembles a more homely feel with sideboards, a console table and music system. Little touches like picture frames and plants soften the retail feel. There is no till, simply a table with inbuilt-screen for seamless transactions. Illuminated shelving enables the uniquely designed acetate frames to stand out with enough space to visually digest the variety of shapes and styles.